The Connecticut General Assembly was called to order in early January for the for 2017 session. This is a full session year where the legislatures will be submitting bills for a variety of issues. 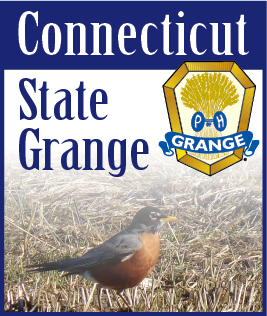 We have already started watching for proposed bills that concern topics of Grange policy. This is also the session that the states bi-annual budget is presented. In early February the Governor presented his proposed budget which has generated a lot of discussion since. The governor says that these proposals are needed to close a $1.7 billion budget deficit. A majority of towns and cities would experience major hits with the proposed changes in funding formulas. The proposed budget greatly reduces state funding to many of the “more wealthy” towns and increases funding to the needier cities. Some groups are calling this proposal the “Robin Hood” budget. A few cities would benefit from this plan with increased funding but more than 130 towns would lose funding. Currently towns do not contribute to the teachers’ pension plan. The budget proposal includes requiring cities and towns to contribute about a third of the obligation to the teachers’ pension plan payment which would be about $400 million. The Governor has proposed allowing towns to now charge hospitals real estate taxes to help them generate revenue. Most hospitals are non-profit and are exempt from property taxes. To counteract that expense to the hospital the state would increase Medicaid reimbursement payments to the hospitals. Problem is that in future years the state could decrease these Medicaid payments while the hospitals still have to pay the property taxes. The Governor also wants to cap some of the Medicaid programs and change eligibility requirements for adults who are presently receiving insurance through the Husky Program, making some ineligible. Of course the proposed budget includes renegotiating the state employee contracts and is asking for $700 million in concessions. The Governor says that if they refuse the concessions, he will lay off over 1000 state employees. Imagine if a local business in the state announced that they will be laying off over 1000 employees, the Governor would be on the phone to try to stop that and offer concessions. He also wants a 10 percent cut in all agencies budgets. This would have impacts on services through the state from social services to state parks. The budget is now in the hands of the Senate and House members. The Governor’s proposal is a starting point and the actual budget may be drastically different from what is proposed. There will be many recommendations and revisions before the final budget is passed. Hopefully the two parties will work this out together and it will be completed by the end of the session in June. If not, they will be back in special session.